I can barely control my indignation when I read articles about Google Plus as a tool for “social collaboration”. These articles sometimes come from writers I respect. I guess we have a difference of opinion on this. Here are my reasons why I think Google Plus is not a tool for social collaboration (even remotely). The last I remember, social collaboration was supposed to be about learning from the design concepts of social media tools like Facebook and Twitter, and adapting them to a business environment to spur productivity and collaboration. The key phrase here is “learn from design concepts and adapt them”. Google Plus is an out and out consumer tool in fierce competition with Facebook. Can anyone show me even a single change made to Google Plus in Google Apps to make it adaptable to business? Surely there is some difference in consumer and business needs. 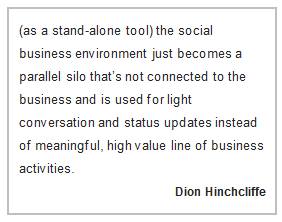 Social collaboration in the enterprise is not about networking and sharing stuff for the heck of it. In fact it means nothing if it is not connected with company information and processes. Social collaboration should not be an end in itself but subordinate to getting the job done. In fact, when connected with enterprise data – documents, tasks, schedules, and discussions – social tools become an incredible way to consume information, break organizational barriers and bring together people in a conversational yet productive environment. Google Plus has no connectivity with other parts of the business. Even in Google Apps, it has no connectivity with other applications like Google docs, mail, calendars or tasks. It might spur some light weight conversations and connections, but does not bring much business value. The beauty of social collaboration is that it leverages the open, conversational design of social media, but combines it with the structure and policy control mechanisms required in business. So even while people share information freely, everyone has access to exactly the information they have rights to. Admittedly, Google Plus has an interesting concept of intuitively structuring people into “circles”. But policy control needs in businesses go beyond that, and social collaboration needs to reflect that. Each group needs to have further ability to distinguish between group members, and fine tune access levels right down to every piece of data. Google obviously isn’t going to have two versions of Google Plus, one for business and one for consumers. Its product direction is evidently going to be driven by the dynamics of the fiercely competitive social networking market dominated by Facebook. In fact, its very future might depend on controlling the consumer social network market. Does a business really want to ride its boat on this stormy consumer market? 5. Social media marketing is not social collaboration. People sometimes confuse the concept of using popular social media platforms like Facebook, Google Plus and Twitter to promote their business, with the concept of using social media design principles internally to spur productivity and collaboration. The former is better described as “social media marketing” and the latter is “social collaboration”. It makes all the sense in the world to do social media marketing, and use all the attention and activity in these networks to market ones products. Even we have a company page on Google Plus to market ourselves in this community. This, however, is a totally different baby from social collaboration, where networking, activity streams, “following” and other social tools are seamlessly worked into the collaboration tools we use to accomplish work on a day to day basis to improve productivity. That is not Google Plus’ forte. At HyperOffice, we have been working on new social capabilities, which deeply integrate with our widely known communication and collaboration suite. Our attempt has been to bring businesses the benefits of new social technologies, but at all times keep it linked it to business data and processes, and contribute to job completion, rather than distract from it. Let us know if you want to be informed when we launch our social collaboration features.